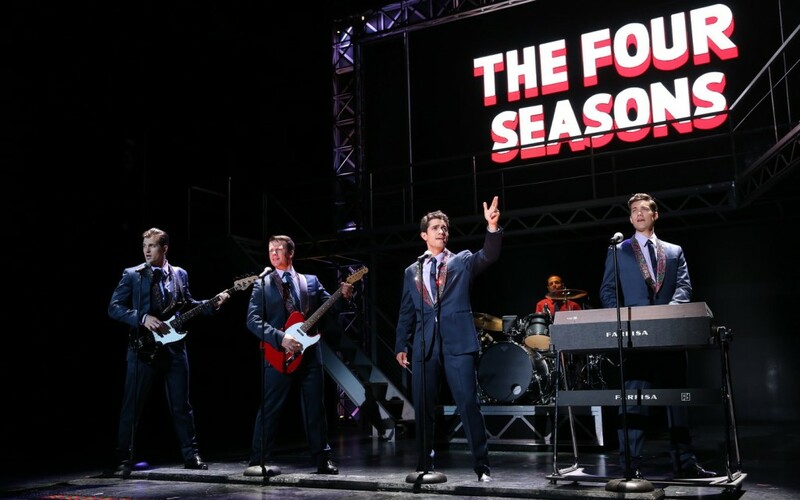 Chronicling the lives of Frankie Valli and The Four Seasons who congregate as four misfits off the New Jersey turnpike with stardom in their eyes, ‘Jersey Boys’ continues to hit the mark of excellence in its many touring productions. “After eight bars, I knew I needed to write for this voice,” reminisces composer phenom Bob Guardio (Drew Seeley) regarding the creative collaboration that would stand the test of time with pop vocalist Frankie Valli (Hayden Milanes). These are just two Jersey Boys, and there are still two more behind the musical story that depicts an untouchable legacy of trials, tribulations, and a handshake contract that has sealed a life-long friendship. And eight years after making its Toronto premiere, Jersey Boys continues to chart success thanks in part to unique narrative framework, cutting edge production values, and a live concert vibe that makes you feel like you were with the foursome during their rise to the top. The first half of the show is a prelude to superstardom highlighting run-ins with the law, record contract misery, the search for a definitive sound, and the strains of loyalty and partnership. By act two, The Four Seasons reach icon status with more relationship ripples beginning to show and band member Tommy Devito (Nicholas Dromard) pushing the band to the brink of destruction. Watching the story of small town dreamers hitting the big time is a feel good experience unto itself. Yet Jersey Boys is so refined, audiences can literally feel the adrenalin of the era as its told on stage. This rare theatre experience is what’s allowed the production to have the prolonged shelf life that it’s experienced since 2008. Actor Drew Seeley’s Bob Gaudio is played with pure pleasantry. The character is the kind of guy you want watching your back when Seeley charms it up as a true artist steering clear of the ego trap. Talking about immensely large shoes to fill, Hayden Milane’s insertion into the leading role of Franki Valli proves he knows how to tie the laces tightly. Madden’s tenure at the Shaw Festival, rock star looks, and vocal range makes him a logical fit for the part. Jersey Boys is a powerhouse musical that knows where it wants to go and precisely how to get there. The prevailing energy and style makes the offering come across as a bona fide rockumentary. “Nothing felt as good as four guys under a street lamp the first time you made that sound,” Franki Valli says in retrospect. And nothing feels as good as seeing this all-star cast relive that moment on stage.